pets living in units or two-storey houses against falls from windows, balconies or stairs. We offer cutting edge technology to give parents peace of mind." 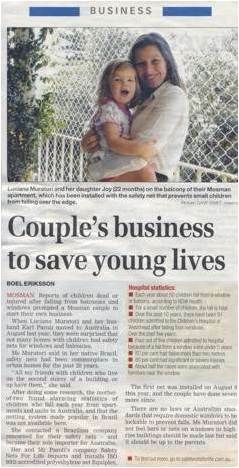 Safety Nets For Life® works with one of the world’s leading netting manufacturers to provide Australian parents with attractive solutions to improve the safety of their children at home, especially those living in high-rise buildings. Safety Nets For Life® system is a quality modern product, which has been developed by an Argentinian architect and mother. It is virtually transparent, versatile and very easy to install. Safety Nets For Life® was created in 2011. The first installation happened in August 2011, in Randwick, Sydney. Luciana Muratori looks after marketing, sales and the financial side of the business. Karl Paroli is responsible for training and staff supervision. Safety Nets For Life® donates AU$5 from every sale to a charity organisation that works with children. 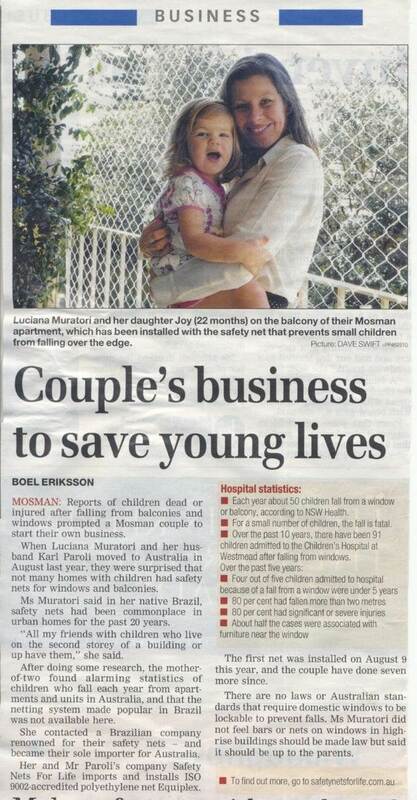 - Sydney Morning Herald article about clients getting refused permission to install safety nets in their units. - Stratas might face up huge bills if a child falls, not to mention the psichological impact in every resident.